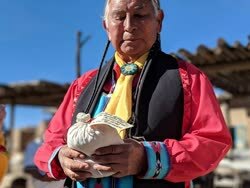 Today, under beautiful bright sunshine and glistening snow upon the mountains above Taos Pueblo we feasted to honor the indigenous foods, the ancestral knowledge of our food ways and our seeds as a part of the SW Intertribal Food Summit. 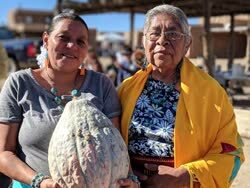 We had the honor to participate in the Seed Rematriation of an old landrace variety of Taos Pueblo squash that had been away from this community for decades in the Seed Savers Exchange Seed bank. 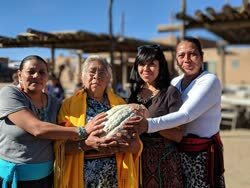 Indigenous Seedkeepers Network has been working together in a collaboration with many people and organizations to reunite native seeds back into tribal communities of origin. 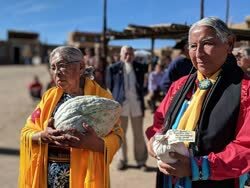 It was a deeply healing and emotional welcoming home circle, as the Governor of the Taos Pueblo and elder farmers like Henrietta Gomez received the gift of the first harvest of seeds, with more to come. 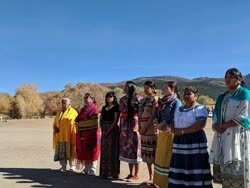 They pledged their renewed commitment to multiply these seeds for future generations and expressed deep heartfelt joy that these seeds were coming home to this land where they co-evolved since beyond living memory. 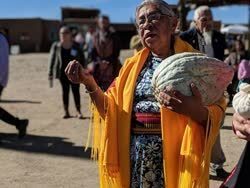 The women caressing the squash like a baby, tears glistening in their eyes, there is so much love on this path to restore our relations to the foods of our ancestors. Part of this rematration path, of finding our seed relatives and carrying them home, is reawakening the intertwined harmonies of seedsongs of our ancestors, ourselves and those yet to come. Whatever it takes, we must continue to carry our ancestors greatness into tomorrow, and our seeds are one of their precious gifts for us in this day� Inside those seeds, Our ancestors prayers are still protecting us. Lu White This warms my heart. I just met Henrietta in Sept when I was in Taos for a healing weekend. A dear sweet gentle soul. I was so fortunate to spend some time listening to her stories and receiving her blessings. 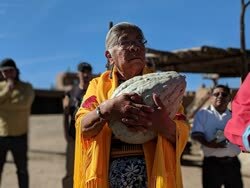 Antoinette Gonzales Henrietta, you are a cherished elder, who has taught me so much. Thank you being in my life. Grace Tracy what a beautiful picture!! of a very honorable man I met over the weekend. I want to be a leader like him. "He puts his people first"